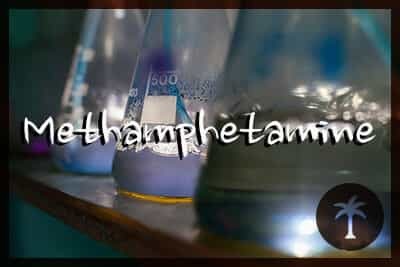 Primarily an illegal drug manufactured in illicit laboratories, often in rural areas, methamphetamine is a powerful and highly addictive stimulant drug. The Drug Enforcement Administration (DEA) classifies methamphetamine, or meth for short, as a Schedule II controlled substance. This is the highest designation for a drug with an accepted medical use within the United States. Methamphetamine does have a very limited medicinal purpose to treat attention deficit hyperactivity disorder (ADHD) and obesity under the brand name of Desoxyn. Mostly, however, it is illicitly manufactured and distributed for recreational use. Meth is available as both a white powder and in a glass-like rock form called crystal meth. Meth may be smoked, snorted, injected, or swallowed when abused, and it leads to an intense and rapid-onset “high.” The high is intense and euphoric, but also short-lived, so the drug is often taken in a “binge” pattern wherein an individual takes back-to-back doses to prolong the experience. Meth is also taken in a “run,” which is when a person binges on the drug for several days without eating or sleeping. The report Key Substance Use and Mental Health Indicators in the United States: Results from the National Survey on Drug Use and Health (NSDUH) publishes that, in 2016, approximately 667,000 people in the United States were considered to be currently abusing methamphetamine. What Are the Dangers of Smoking and Snorting Meth? What Are the Long-term Issues with Methamphetamine Use? Methamphetamine is a drug that has plagued rural and urban areas alike. Abuse runs rampant through the Midwest and is common in Hawaii. Meth is also regularly found in large cities like San Diego. The drug can be manufactured by using an over-the-counter (OTC) cold medication containing a stimulant like pseudoephedrine or ephedrine. The Combat Methamphetamine Epidemic Act of 2005 made these OTC medications more difficult to acquire in bulk, and manufacturers and distributors had to get more creative. Meth lab incidents did decrease after the law was put in place, the Office of National Drug Control Policy (ONDCP) publishes, but methamphetamine is still illegally manufactured and abused. The 2016 NSDUH reports that the majority of people who abuse meth today are adults aged 26 and older, as out of the more than 600,000 people who used it in the month prior to the survey, more than 500,000 were at least 26 years old. The Monitoring the Future (MTF) survey of 2016 published by the National Institute on Drug Abuse (NIDA) reports that 1.2 percent of high school seniors admit to using meth at least once in their lifetimes while 6.5 percent of adults aged 26 and older reported its abuse in their lifetime. As a stimulant drug, meth increases energy and attention levels, helps to keep a person awake, and suppresses appetite. It also raises body temperature, and elevates heart rate, blood pressure, and respiration rates. NIDA reports that meth likely increases the production of pleasure-inducing dopamine, one of the chemical messengers found naturally in the brain. High levels of dopamine in the brain is likely what causes the intense burst of euphoria that meth induces. Meth can overwhelm a person’s system, however, and an overdose can cause cardiovascular problems, including heart attack, stroke, seizures, hyperthermia, and organ failure, which can all lead to death. The National Vital Statistics Reports publishes that in the United States in 2014, nearly 4,000 overdose deaths were attributed to methamphetamine – a rate that almost doubled in a five-year period. The DEA publishes that over 3,000 poison exposures were reported to the American Association of Poison Control Centers in 2011, and more than 100,000 emergency department (ED) visits for meth abuse were reported that same year. Aside from a potentially life-threatening overdose, meth can also contribute to erratic and out-of-character behaviors that may lead to criminal or legal problems, injuries, or accidents. A person is more likely to engage in activities or behaviors that are high-risk when under the influence of a drug like meth. Questionable sexual practices that can lead to the contraction of an infectious disease can be a potential side effect of drug abuse and intoxication as well. Meth can also cause a person to become aggressive, hostile, and violent when someone is under its influence, particularly when it is being used on a regular basis, making users a potential danger to the people around them. Meth makes changes in the brain that relate to how a person thinks, feels, and acts, which can have both immediate and long-lasting consequences. The impact on the brain from meth can last longer than the high, and the more often a person uses the drug, the more damaging it can be. Methamphetamine is a neurotoxin, impacting levels of microglia as well as dopamine in the brain, NIDA warns. Microglia are important to brain health, helping to fight off infectious agents and expunge neurons that may be damaged. When too many microglia are present in the brain, they can actually start attacking healthy neurons. Brain mapping studies of people who have abused methamphetamine showed levels of microglia that were nearly double that of someone who never abused the drug. Prolonged exposure to high levels of meth also interferes with the brain’s ability to regulate dopamine production on its own, which can make it difficult for a person to feel pleasure without the drug. Meth impacts regions of the brain involved in learning and memory formation as well as movement and cognition, and chronic meth abuse can damage these parts of the brain. Chronic meth use can increase the risk for stroke and the risk that a person will suffer from Parkinson’s disease, a movement disorder. When meth abuse is perpetuated, individuals may begin to suffer from psychosis when under its influence, and hallucinations, delusions, and paranoia may occur. Anxiety, episodes of violence, confusion, insomnia, and mood disturbances can also be side effects of meth intoxication in people who have been using it for a long time. Regular use of meth can cause a person to become tolerant to certain levels of the drug, and they will need to take more each time to feel the results. This can contribute to the onset of physical drug dependence and difficult withdrawal symptoms when meth isn’t active in the bloodstream. Methamphetamine is considered to be extremely addictive, especially if it is taken in a binge pattern. The 2016 NSDUH reports that approximately 667,000 people aged 12 and older battled methamphetamine addiction in the past year. Meth addiction interferes with a person’s ability to function normally in everyday life. Activities and social events are given up for meth-related reasons, obligations are left unfulfilled, work and school production as well as interpersonal relationships suffer. People struggling with meth addiction are more prone to engaging in potentially hazardous behaviors; spend a lot of time thinking about meth, such as where and how to get it, using it, and recovering from it; and often become secretive and isolated. Mood swings, aggression, and behaviors that aren’t characteristic are also signs of meth addiction. A methamphetamine “crash” can last 1-3 days after the last dose of the drug, the National Highway Traffic Safety Administration (NHTSA) warns, and the side effects are often opposite to how a meth high makes a person feel. Extreme fatigue, intense depression, irritability, disorientation, apathy, uncontrollable sleepiness, trouble feeling pleasure, tremors, anxiety, and cravings are possible side effects of methamphetamine withdrawal. These feelings can be intense and often encourage a person to use more meth to dispel them. Some of the mood swings, psychotic thoughts, memory and cognitive deficits brought on by meth addiction and withdrawal can last for months or even years after stopping its use. The good news is that NIDA reports that much of the damage to brain function and structure due to meth use may be reversible with prolonged abstinence. A medical detox program can help to minimize relapse and aid in managing the symptoms of meth withdrawal. Detox that is performed in a specialized facility provides around-the-clock supervision, encouragement, and monitoring to ensure that a person remains safe during withdrawal. Medical detox programs offer a supportive, calm, and structured environment to allow meth to process out of the brain and body. There are no specific medications to treat meth addiction or withdrawal; however, medical and mental health providers may use pharmaceutical tools to manage specific side effects of withdrawal during medical detox. Antidepressants may be helpful for the significant depression and potential suicidal ideations that can accompany meth withdrawal, for instance. A detox program works to help a person become physically stable, helping to reset sleeping schedules, improve malnutrition, and allow the drug to process safely out of the system. Detox is an important part of a complete addiction treatment program. Detox is not a standalone treatment for meth addiction, but rather one aspect of a comprehensive program. After detox, a person should enter into an immersive addiction treatment program. A major component of addiction treatment is behavioral therapy. Therapies such as Cognitive Behavioral Therapy (CBT) help a person recognize self-destructive and detrimental patterns of behaviors by looking at, and changing, negative thoughts. Group sessions include life skills training, relapse prevention, stress management, and education on meth addiction. Individuals counseling and therapy sessions can help a person learn how to cope with and manage personal triggers and stressors. Motivational Interviewing (MI) is another form of behavioral therapy that may be beneficial during meth addiction treatment, as it can help a person to find their own motivation to make positive changes. MI is non-confrontational, and the individual is able to come to terms with the fact that meth abuse is negatively impacting their life and discover the motivation to choose sobriety. Reinforcing positive drug tests with small rewards and incentives is another form of behavioral therapy, Contingency Management (CM). This is another form of treatment for methamphetamine abuse and addiction that NIDA publishes can be beneficial. Peer support groups, such as those that are part of a 12-Step program, can help a person to minimize relapse and sustain long-term recovery. These programs provide fellowship with others who share similar goals for sobriety, and they can offer tips and methods for sustaining it. A methamphetamine abuse and addiction treatment program may also need to account for co-occurring mental health or medical issues, and these should be treated in a simultaneous and integrated fashion. Residential treatment programs can provide the highest level and standard of care, helping to improve a person’s overall quality of life. In a residential treatment program, nutritional balance can be restored and physical health attended to with fitness programs and structured sleeping and eating schedules. Alternative and holistic measures, such as yoga, mindfulness mediation, massage therapy, spa treatments, chiropractic care, and acupuncture, can also be beneficial during a meth addiction treatment program to restore a person’s overall health and wellness. Transitional and aftercare programs can help to minimize relapse, as they provide ongoing support. Methamphetamine addiction treatment is individual. Each person should have their own personalized treatment plan that can aid in a long, healthy, and sustained recovery.